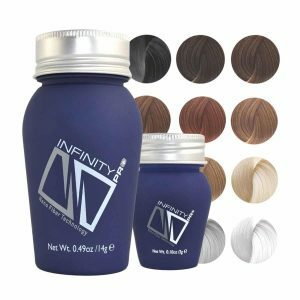 Infinity Hair Powder is a product that provides the appearance of thicker and fuller hair in 30 seconds or less. It gives the user an INSTANT result and instant confidence when they need it, Infinity Hair Powder is an option for those who do not want to undergo hair transplant, grafting or other evasive treatments for hair loss which are also very expensive. This product uses Nano Fiber Technology to create a long-lasting bond between your existing hair and the hair fibers,the hair powder will not work if you are completely bald. The formulation is derived from cellulose Nano fiber materials making it safe and healthy for your hair and a guarantee that it will not irritate your scalp or clog your pores.The application of Infinity Hair Fiber is like dispensing thousands of tiny, micro-fibers to the hair. These fibers create an instant bond with the natural hair to fill in the visibly thinning areas. You can choose the best shade to match your natural hair color for best results. The shades available are black, dark brown, medium brown, light brown, dark blonde; light blonde, auburn, cinnamon, gray and white. Infinity Hair Fibers are totally undetectable, even when you look up close. After application and when you are satisfied with the look, finish with Fiber Locking spray to lock in the fibers and to add beautiful shine for a more natural look. Infinity Hair Fibers remain in place for days or until the next time you wash and shampoo your hair. Say goodbye to that visible scalp caused by hair loss or thinning hair. Now you can style your hair the way you want it with Infinity Hair Building Fibers. This keratin powder will make your hair look thicker and instantly hides your visible scalp upon application. Choose from our 10 different shades to match your natural hair color. It is so easy to use just make sure that your hair is dry and style it with your favorite product. Shake the bottle of Infinity Hair Fibers over the desired area and lightly pat the area to allow the fibers to fall into place. When the desired look is already achieved, finish the look with Infinity Fiber Locking Spray. Choose the Best. Choose INFINITY!